I have been playing with Lilypond a little more, and here are some themes that I have transcribed. They are all from John Carpenter movies: the first is the theme from “Halloween”, which is an interesting 5/4 time piano riff; the second is the synth theme from “Escape From New York”, and the final is the ending credits music of “The Thing” (known as “Humanity Part II” on the soundtrack album). The last one is a bit messy as I couldnt get Lilypond to hold the ties across multiple bars properly. This is still not 100% finished – there are some omissions. Plus, my transcription may be incorrect in places. 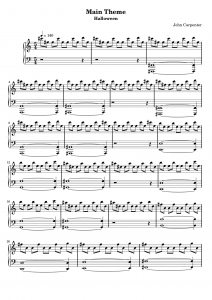 There is a whole bunch of obscure and wonderful music out there that I have been meaning to transcribe and arrange for the piano, and so I have been looking around for decent music transcription software, and I recently came across lilypond. This is to music engraving what TeX is to mathematical typesetting, and the results are really very nice. The downside of lilypond (as with TeX) is the slightly steep initial learning curve. 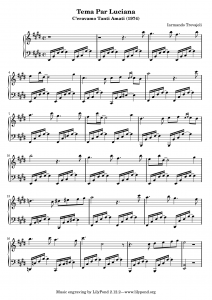 To put it to the test, I have transcribed a piece of music that I came across a while ago – it’s called “Tema Par Luciana”, and is from an old Italian movie called C’eravamo tanto amati. I haven’t seen the movie, but I came across the theme in a mix created by a French DJ called elektrosonik. The piece is simple enough that it was pretty straightforward to transcribe, but also has enough variety that it is a good starting point for learning lilypond techniques.